If you've taken the plunge into the rocky waters of eReading (and, really, who hasn't?) then you've probably figured out which reading device(s) you feel comfortable with, and you've likely found a preferred app or two. But how organized are your eBooks? Do you have a handle on which books you own, do you know what they're about, and have you prioritized your reading list? If you're even a little like me, you're likely struggling with these issues. Here are two steps I've taken to help me keep track of my eBooks as easily as I do the physical books on my shelves. Yes, you've heard me rave about Calibre before, and that's because this program is key to my eBook management and organization. 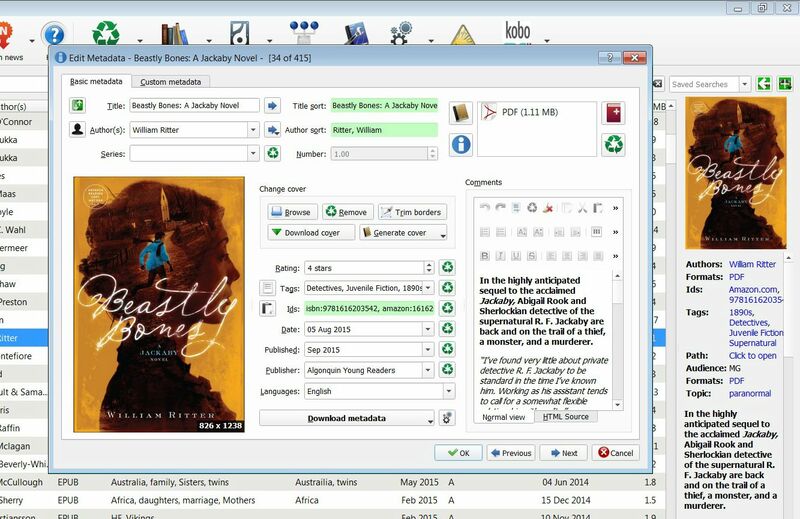 I transfer every eBook, no matter the source, to Calibre so that nothing is lost on various devices, and I have an up-to-date database of all my eBooks. Here's how Calibre helps me stay on track. In addition, I've added three customized tags to my Calibre spreadsheet: audience (adult, young adult, middle grade), source (library, ARC, bought), and topic (my own subject categories). I use the source data to remind me to delete library books and to not delete any book I paid for (until I'm ready to do so). 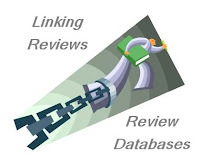 The tags I add to topics include blog ideas, like "Halloween post"; alert me to data I want to track, such as diversity; and/or link the book to some other random fact, like the setting. How has this helped me? All the columns and tags in Calibre are searchable, which means I can find books based on genre, a custom topic, a CIP subject, publication date, audience, or whatever else I've recorded. Plus when I click on a book title, I can read the publisher's summary right from the Calibre spreadsheet (seen at the far right in the image), without having to open the book file, which further helps me decide what to read next. Ah, Dropbox, how I love you. Although I have my eBooks in Calibre, I upload all of them to my Dropbox account as well. This makes all my eBooks available to me and my devices even when I'm away from my computer. Dropbox also serves as an extra backup for my eBook collection. Although you can make folders in Dropbox, I leave my eBooks in one long alphabetical list so I can quickly find what I want when downloading to my eReader, phone, or tablet. What I describe in this step is applicable over a wide range of apps and eReaders, although the example I give is from my experience with Bluefire. Remember all that information you have stashed in Calibre? Here's where it will all come into play in a pretty cool way. Did you know that you can organize your books in your apps and on your reader? This is the second key to never losing track of your eBooks. First I'll tell you how to set up a collection, and then I'll tell you some of the advantages. Bluefire: Begin by clicking on Library, and you'll see your collections (one of which is Dropbox, which makes for easy downloading). To make a new collection, click on New Collection, name it, and then select which books you want to have in that collection. For this example (see image; click to enlarge), I have one collection called MG - Fall, which contains middle grade books published this fall, and one collection called October, which contains books published next month. 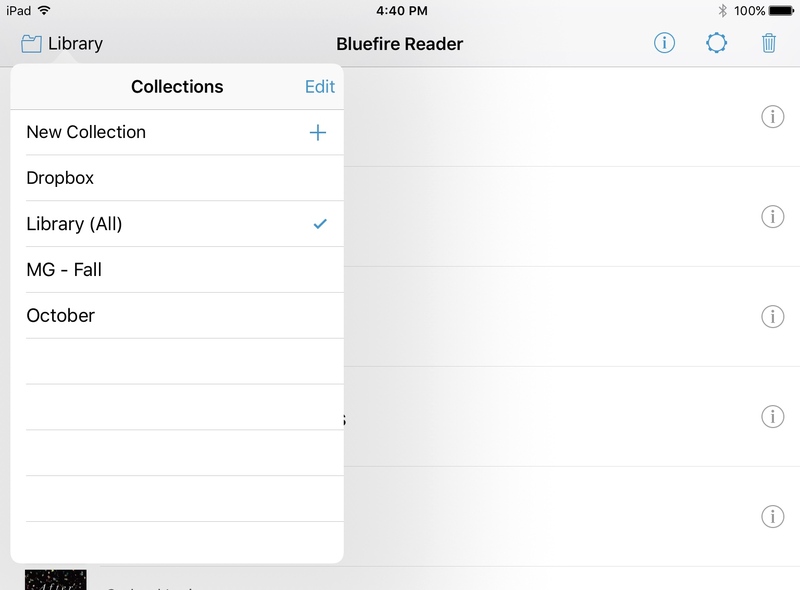 Now here's the really great thing: In Bluefire, books can reside in more than one collection. This means that I can organize my eBooks in a ton of ways, using the data I collected in Calibre and how my crazy mind works. I can create collections based on publishing month, genre, audience, setting, freelance assignment, and whatever makes sense. For example, a book like William Ritter's Beastly Bones can appear in all of the following collections at the same time: middle grade, series, Halloween, and September 2015. Once I realized how flexible collections were and how easy they were to create, change, and delete on my tablet, I felt I had finally tamed my eBooks. Now nothing gets lost in the shuffle, and I can find the perfect eBook for whatever my needs are at the moment. iBooks: You can easily make, change, and delete collections in iBooks (start by tapping All Books), but books can't live in more than one collection at the same time. So although I think iBooks works more smoothly on my tablet than does Bluefire, I don't use it very often because of this limitation. Kobo Aura HD: You can easily make collections (called shelves) on the Kobo, and books can reside on more than one shelf. But -- and this is huge -- I cannot find a way to delete shelves once I'm done with them. Seriously. I've searched the device, the owner's manual, and the Web. This makes me very itchy; I hate, hate, hate having old empty shelves clogging up my device. GRRRRRR. So there you have my two-step guide to taking the stress out of managing your eBooks. If you have any advice or tricks, please share. I'd love to learn more. I need to check out Calibre. I have so many books on my Kindle and have no idea what any of them are! I like how searchable it is so I can search by genre instead of having to go through page after page of titles. Yep - same here - Calibre, Dropbox, Bluefire Reader. I don't use the same tags but I do keep track of which are on my ereader and which are on The Hubsters. PDFs all go to the tablet. Thanks for the info. I'll have to check those sites out. This is a fantastic post. You have so much great information here, I've bookmarked it to reference. Thanks! It's way past time for me to look into Calibre... my ebooks desperately need organizing! Thanks for such an informative post. I tried Calibre before and couldn't get it to work for some reason. Maybe time to try again? One of the many very cool things about your site is the great information you share. It's always relevant to my interests and I learn something from you many times a month. Calibre sounds great, need to check it out. Funny this is a recent post here as I have a notebook with this very topic to tackle this weekend. I make folders on my Kindle, they call them collections, and my latest collections are labeled by author. This is a an interesting post. I don't read a lot of ebooks, but I'd be sure to keep your suggestions in mind if somebody was looking for storage ideas. Wait - so I can download the books on my iPad in Bluefire or on my Nook to Calibre? A few months ago I needed to get a new Nook and I was so worried that I would lose my books if I opted not to go with a Nook. If I can move them somewhere else to save, that would be great!